Irene Wiecek, a Senior Lecturer in Accounting and Associate Director of the Master of Management & Professional Accounting Program (MMPA) at the University of Toronto, Mississauga’s Institute of Management & Innovation, always believed that the program should not only focus on educating the future Accountants, but preparing the students to enter the workplace as well rounded members of the organization – good team players, good leaders, committed contributors. The subject offering of the program therefore is very robust and focuses on much more than the superbly delivered technical aspects of the job. Experiential learning and adult learning principles play a significant role in the way the MMPA program is deployed, and the faculty is always interested in providing meaningful learning opportunities, integrating the harder and softer aspects of the curriculum. Below is a blog about the Amazing Race experience, giving the students a chance to work together and get to know each other beyond the more traditional framework. MarchFifteen is very privileged to partner with the UofT in providing this experience. I know it is fun and powerful for the participants… but, as a facilitator of the program, it is wonderful to observe the team dynamics in play. Spirits were high as MMPA 2015 anxiously waited to begin The Amazing Race challenge run by Edyta Pacuk, President of MarchFifteen Consulting. The Amazing Race is an annual event; it is a fun and challenging competition to enhance a sense of team and promote a higher degree of trust and collaboration between members of the MMPA program. Students are challenged to work as a team to overcome obstacles, both physical and intellectual, in the shortest time possible. Students began by breaking into groups and creating inspirational team names; such as, the Inner Ninjas, Bazinga, Super Marios and the Accountables! Teams were given hints to certain locations where they would face their challenges. Once students were given the green light they left in a racing fury in hopes of being the grand winners. Groups were tested physically and mentally. Their problem solving skills, coordination, leadership, and creativity are just some of the life skills that were tested, all the while working cohesively as a group. 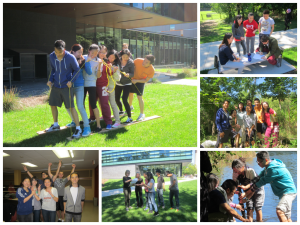 “It was great to get out of the classroom and have fun with our peers”, commented Shawn Huang, MMPA 2015 student. The challenges are intended to give the groups experience working under pressure within a limited time frame. This will help students to put what they have learnt in The Amazing Race to use when completing their Case Competitions, an important integral part of the MMPA program. In the end, this year’s team winner was team Super Marios. Congratulations to all MMPA teams on a challenge well done!